DigElogROCORI: Reichel & Kuss Sing "The Prayer"
Reichel & Kuss Sing "The Prayer"
This past Sunday, October 30th, 2005, Peace Lutheran in Cold Spring, MN, conducted their annual Youth Confirmation service. This year 12 young people were confirmed into the church. They included: Matthew Braunberger, James Chance, Justin Engelmeyer, Ellie Frischmann, Nicole Holmberg, Brian LaVergne, Logan Payne, Reanna Phillips, Melissal Schmit, Brittany Valentien, Dane Vocelka, and Austin Zahara. 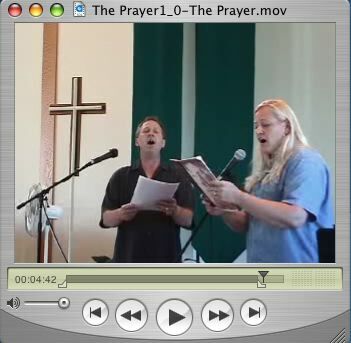 As a part of the service, Karla Reichel & Duane Kuss sang a duet to the beautiful song "The Prayer". They were accompanied by Bette Kuss on the keyboard. Here is a music video version of their performance taped during an earlier practice session.